Submissions: General articles should be sent to editor Brian Pankuch at the above address. We would appreciate both 1) printed copy ( hardcopy ) and 2) a readable me on a Macintosh or IBM compatible 3 1/2" diskette. We have fewer problems with 3 1/2 " diskettes. Email submissions are frequently lost, and formatting and special characters are changed. If attachments are used please send a description of what your using-such as Microsoft Word 6 with Netscape 4, separately. This gives me a chance to decode it. Submission deadlines: Fall issue - Sept. 25; Spring issue - March 15. RATES: USA 1 year $2.50, two years $4.50: Other countries 1 yr $5, two yr $9. Please make a check or money order payable in US funds to Computers in Chemical Education Newsletter. Two issues are published per vear. Paying homage to a retiring committee chair naturally produces mixed emotions, especially when the retiree has had such a productive period of service as Don Rosenthal. During Don's Chairmanship, there has been an incredible amount of progress in the application of computers to chemical education, and Don has ensured that the Committee has played a significant role in this development. When Don became chair in 1992, the personal computer was just beginning to make an impact on chemical education. A few visionaries could see the promise of this new tool, but I'm not sure that anyone really appreciated the changes that were coming. Even the most far-sighted prophets couldn't anticipate applications that we now take for granted, such as the World Wide Web, desktop molecular modeling, symbolic mathematics programs, and many others. The goal ofthe Committee is to encourage and support the use of computing technologies for chemical education. This sounds like a big order, since the Committee has relatively few resources, aside from some very dedicated members, and the community of chemical educators would seem to be too large and diverse for any small group to affect them. In fact, the various programs that the Committee has undertaken in the past few years have helped make many faculty aware of the potential of the new technologies and also have given many faculty members the skills that they needed to make significant changes in the ways that they teach. Under Dan's leadership, the Committee has sponsored symposia at many of the regional and national meetings of the American Chemical Society as well as the Biennial Conferences on Chemical Education. It has also developed and sponsored workshops to help college and high school teachers learn new techniques for teaching with computers. I don't have any solid data that show how effective this work has been, but 1 have heard a lot of anecdotal evidence to suggest that many of those who are currently active in the field got their start from these symposia and workshops. not only because they bring together an international roster of chemists to discuss common problems, but also because they give faculty a taste of the interconnected world in which our students will live and work. More recently, the development of the On-Line Chemistry Courses has brought together chemistry students and faculty from all over North America, and enabled them to work with experts from industry to explore special topics in chemistry. The most recent course, which is being held this spring, involves approximately 130 students from 15 different colleges. The continued success of these on-line projects shows that the new technology can, indeed, turn the entire world into our classroom. The archives of the On-Line Courses and the On-Line Conferences represent a significant resource in chemical education, which is available to anyone with Web access. Don has provided the inspiration, ideas, and hard work necessary to make sure that the Committee on Computers in Chemical Education has not simply encouraged faculty to use the new technologies, but has also demonstrated some of the new capabilities that these technologies make available. In doing so, he has served both the Committee and the community of chemical educators extremely well. We are all more aware of new educational possibilities because of his contributions. I am delighted to have this opportunity to express our appreciation to Don Rosenthal for his service as Chair of the Committee on Computers in Chemical Education. 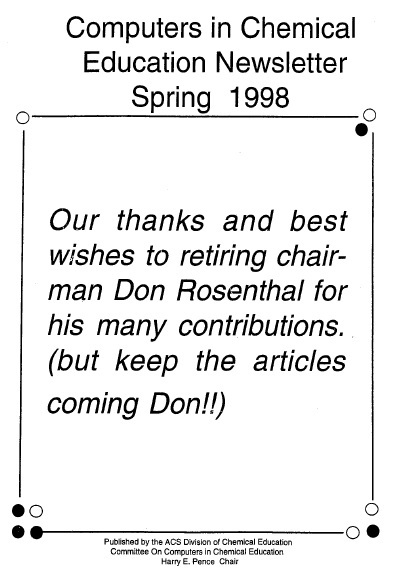 I am equally happy to report that Don will still be serving as a member of the Committee. We look forward to his continued contributions.